Most advertisers don’t appreciate this, but the product descriptions are the game changer for shopping ads. Not just because it helps Google pick your products for the right customer intent, the product description also helps customers make a purchase decision. And yes, it is essential to write descriptions that are explanatory, crisp and plagiarism-free. The reason I mention plagiarism-free because it’s widespread today to read the same description over and over again for similar products either from the same shop or different shops. Such descriptions leave customers not very impressed. 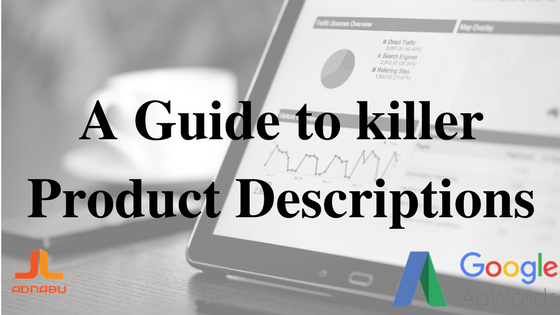 I will be talking about how product descriptions can improve the success of your business in this blog. How to find good product descriptions? Before you get on to writing descriptions for your products, try to spend some time analysing similar products of different competitors. Scrutinize their content. You will get an idea of what’s working and what’s not. But keep in mind that you are analysing competitors for inspiration, not to duplicate their ideas. Customers who have used your products are most likely giving their feedback in the form of comments, reviews and testimonials. Study these inputs and use them to describe your products. Because what existing customers like about your products is what your new customers are probably searching. Note: Never use product descriptions from the manufacturer. How to write great product descriptions? Never lie, keep it transparent. Include all the features of your products. Use the right words to describe your products. Highlight the advantages of products over competitors. Discuss how your products help customer overcome their problems. Note: Instead of writing lengthy paragraphs, use bullet and pointers for customers to read through the descriptions with ease. 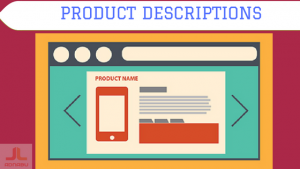 How to product descriptions impact your business? Having learnt how to find and write product descriptions, let us see the benefits of good descriptions. Products descriptions are one of the primary ingredients of improving conversion rates of shopping campaigns. They also help in building a solid on-page SEO which in turn allows products rank higher on Google SERP. Detailed product descriptions make it easy for customers to select the right products which means they are less likely to be unsatisfied and return the products or ask for a refund. Are the product descriptions working? Review and report the conversion and bounce rates of all your product pages using your analytics software. Monitor the progress over time and if the conversion rate improves and bounce rate decreases, your product descriptions are working! Note: Always spell-check your descriptions and review them before publishing. The intention of this blog is to highlight the most important consideration to having killer product descriptions. And I hope you find it resourceful. For help on improving the conversion rate of shopping campaigns, other shopping campaigns related topics and Google Ads topics visit our Google Ads and PPC blog.